The weather certainly has been paying attention to the calendar. Sunday it was 86F. Monday was the Equinox, and by Friday it was 68F. Next week it will be near 60F, with lows just below 40, but things will improve for the weekend and into mid-October. Did another sweep of anything red in the tomato line. Two over 5oz, 25 (54oz) big enough to count, plus another 47oz of ones that were bigger than cherries, but not much bigger than walnuts. Also dug up four carrots: a 9oz monster, reminiscent of a Mousterian hand ax, a couple of 2.5oz, and a double that still didn’t go much past 2.0. Finally, an 11oz yellow softball I found in amongst the tomatoes, next to the tag saying 8-Ball. 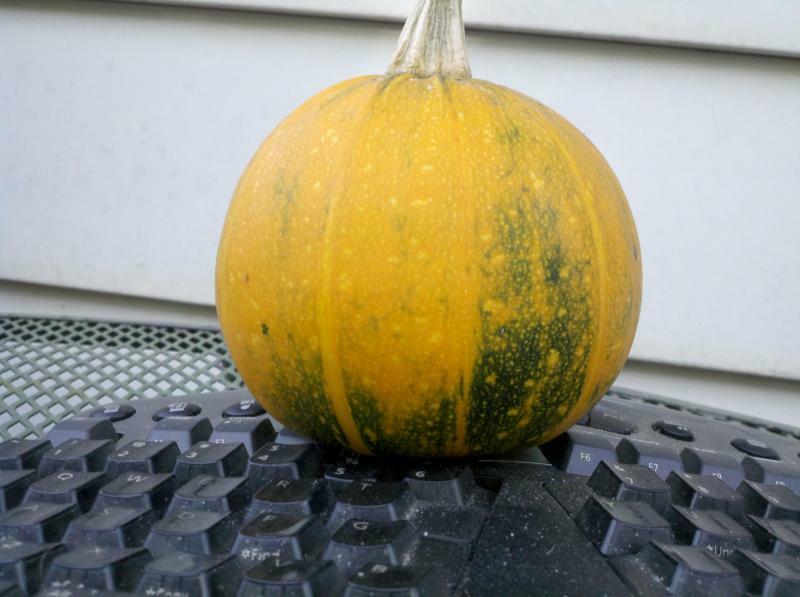 It’s not solid enough to be a pumpkin, so I think it really is a really ripe 8-Ball. When MJ gets home from her trip, I’ll try it on her. Tore out the last of the summer greens and planted some more. Of the 12 peas I planted in a container two weeks ago, only one has sprouted, so I repeated the application. I may have buried the first ones too deep. Now, they’re due in early December. So far, we total 87lbs of produce for the season. That well exceeds last years, and is beginning to challenge last-years-plus-jack-o-latntern. The weather this week was warm, but not hot. Highs were 80F +/- 3. Lows were mid 50s. Cloudy, with no rain to speak of, but some pretty brisk winds. Warmer at the weekend. The NW weather guy says this summer is much like what the average summers will be like in 2050, so I guess we’ve go that to look forward to. Harvested a few tomatoes, but nothing else. Radishes due any day now. Original lettuce from Section 1SW is still hanging in there. New lettuce in 1SE is just starting to show. Beans in Section 4 are starting to brown off, six weeks early. Not sure if it was last week’s near-frost or if it’s the browned-off disease. One of the container snow peas has finally sprouted (planted Saturday a week now), so we should have some nice salads come December. Finally tried the zucchini I harvested a week or so ago. Bitter, just like the summer squash. I tried some web-based amelioration (use only the blossom end, cut up, salt, and rinse) and it tasted like a lump of salty fat, with, if you paid attention, a very slight echo of a bitter after-taste in the distance. Obviously, the powdery mildew had left its mark. So I tore out both the summer squash and the zucchini, and the non-productive eight-ball. Not using them in the compost. This time last year, we had ten times the number of squash, and they were all edible. On the other hand, with 52lb of tomatoes, we are ahead of the 51lb total harvest from 2013 (not counting the big jack-o-lantern pumpkins). Same same in 2012, but with only “a few” tomatoes ripe. As I wrote last May, the Opera browser was, even then, a mere shell of its former self. It would appear that the decline continues. Last week I bought a Windows 7 PC. Go ahead and snicker. The fact is, there’s a lot of stuff I have to do for work that can only be done on Windows, and I didn’t want to spend time fiddling with various virtual machines and emulators. Naturally, I keep it in the closet, with just the screen and keyboard showing. Also naturally, I downloaded Opera (24.0), because that’s what one does. The hope is that the Win version is still a decent product. The Help/About is as bad as the Mac version. Three paths – to the .exe, to the cache, and to the ‘profile’, whatever that is. But given that I rarely need the paths, I shouldn’t really complain. Except. The old ‘Hit F12 for site preferences’ functionality is gone. Now I have to dig through the various settings to set the ‘exceptions’ for a website. This makes Opera no better than any of the other browsers. In the past, Opera would treat each tab individually, even if multiple tabs were looking at different pages of the same site. If I was on a page with lots of fine print, I could hit +++ until I could read the text. * If I had another page from the same website open (e.g. comparing products on Amazon), it wouldn’t be changed. This was good, because not all the tabs needed enlarging. Now, all the tabs from a given website get enlarged or reduced, whatever my preferences are. Finally, a really cool Opera feature was the “reload every x minutes” function. This was particularly useful for Twitter, but it would help track any other site that refreshed its content rapidly. Now, that’s gone. Right-clicking the page lets you ‘reload’. Anybody can do that. Even Lynx would let you do that. I suspect these ‘features’ are the result of Opera abandoning Opera and becoming a re-badged Chrome clone. I’ve got nothing against Chrome. Well, their bookmark system is ugly, but so is Firefox’. But if I wanted to run Chrome, I’d do that. Fortunately, Opera 12 for Linux still retains the old ways. But word is, they’re working on Opera 25 for Linux. I won’t be upgrading. * This is personally important to me. It used to be I didn’t have to hit + at all. Then my eyes started to deteriorate and I had to hit it six or seven times. I got computer eyeglasses and all was well, except that my eyes have continued their decline, and now I have to hit + six or ten times, even with the glasses on. I suspect I’ll be getting cataract surgery next Spring. The weather this week was about like last week. Highs averaged about 70F, with one day peaking at 63F. Three nights in the low thirtys. Cloudy, with no rain to speak of, but some pretty brisk winds. Warmer at the weekend. Because one of the nights was supposed to touch 32F, I went out and harvested any tomatoes with any kind of color, ten pounds worth (plus another couple pounds of big-cherry-sized that I don’t bother to count in the stats). Also harvested a small Delicata, and a couple of small spaghetti squash. Lots of green tomatoes left, and one small Buttercup squash. On Saturday, I cut down the hanging tomatoes and the containerized Napa Grape. Funny to think that I’m closing out parts of the garden when some of the tomatoes have not yet produced a single ripe fruit. Dug up the soil in the NG pot and planted a bunch of Snow Peas. They should be ready by the end of November. Also planted some more greens in Section 1 (and put down a grid to discourage squirrels). Another end-of-November crop. If the forecasts of a warm winter hold, it should be OK. This time last year we still only had 11 pounds of tomatoes, and eight pounds of various squash. The year before was even worse. I guess the question is, will this year be able to go the distance, and keep up with last year’s late-but-big harvest? The weather this week was colder than expected. Highs averaged about 70F, with one day peaking at 63F. Cloudy, with no rain to speak of. Tomatoes are the only thing producing right now. Interestingly, we had one tenth this amount of tomatoes by the first week of September last year, and one tomato the year before. Other produce was about the same — six squash, of all kinds, and three cukes in 2013, and five squash/two cukes in ’12. A quick check of the Garden Gantt shows nothing new to come in until October, so all I have to look forward to for the next three weeks is more squash and more tomatoes. I don’t think there’ll be a lot of squash. Did a taste comparison on the various tomato varietals. Not much to report. They all were pretty good. The smaller ones tasted more tomato-y (not just more intense, more like a tomato). The Super Fantastics were watery, both those from the garden and those in the container. Interesting, considering they were on the same watering regime as the others. Another interesting item: the Brandywines are much afflicted by blossom-end rot. This, despite them being, again, on the same watering schedule (and they’re producing fruit in the 2-3oz range, so it’s not like they need more). So, we had half a head of cabbage from the garden, one that was getting pretty elderly with the black spot syndrome. I discarded all the evil bits, and ended up with about a cup of chopped cabbage. Perfect for use as an oatmeal extender. I used a half a cup for this experiment, and will have a different take on the recipe next week. For broth, I had the ham-hock broth that MJ had made in the pressure cooker last week. Not too hammy, but flavorsome. Setup: 1/3 cup of stone ground rolled oats, half a cup of moderate chop cabbage, loose pack, two dinner teaspoons of potato flakes, one cup of ham broth, no salt (because ham). Cook for 10 minutes or so, depending on the exact style of oats. Add the cabbage at the five minute point (don’t want to overcook), and the potato when you take it off the stove. Results: Very good. Cabbage had a crunch to it but didn’t dominate. Gives you one of your recommended threetofive helpings of veg for the day. What, after all, is Art? Uncle Tok tends to think of himself as an artist, or maybe that’s an artiste (they’re both pronounced “ugh”, but the enunciation is different). We all know he’s a great inventor — look at his barkless birch log canoe, and I’m pretty sure he’s the first proto-hominid to come up with the idea of making your arm longer by tying your shale knife to the end of a branch — but we were less convinced of his artistic capabilities. Sure, he’d spent weeks drawing pictographs of birds on the desert floor the last time we visited Far-South Beringia. And sure, when we visited the Old Country by walking around the east end of the Mediterranean he’d spent a whole summer piling up blocks of stone to prove that it was possible to make a cube that came to a point. But what was the point? Was it really art? Well, this year we were back at the west end of the Mediterranean. It was our first time back since Uncle Tok had the smart idea of cutting a notch at the top of the Gibraltar Dam to make a thousand-foot waterfall as a tourist attraction. * This year he was feeling artistic as well as entrepreneurial, and he had this wonderful idea about carving the faces of all our tribal elders in the rock that was all that remained of the dam. Aunt Ja said it would never work. She said the rock was too hard, and that he couldn’t get enough goat’s intestines to let him hang down far enough to do a proper job. Uncle Tok said he was plenty stronger than that rock, and that he’d just find a bigger goat. They argued about it for hours, until Uncle Tok got fed up and wandered off to party with the locals down at the beach. They had this really potent spirit that they made from grapes. They’d put them in a big haggisbag and stomp on them until all the bad tasting juice ran out. Then they’d tie it up until the grapes inside started leaking through, at which point they’d get together and have a ro’tgu’t party. The next morning Uncle Tok was feeling bad, and crawled off to an un-used cave. We didn’t find him until later that afternoon, when we heard this rhythmic scraping coming from inside. We all dashed up, and discovered him working on an inscription, describing his Rock of Gibralter idea and saying how certain reactionary elements had kept him from accomplishing it. Of course, being proto-hominids and not having a proper written language (the elders were still arguing over whether or not to require a special symbol for a subjunctive clause), he’d had to simplify it. But it was there for everyone to see. *Aunt Ja never forgave him, but I thought it was a good idea to have an inland sea between us and some of our relatives in the Old Country, even if it did mean we had to walk all the way around to visit them.